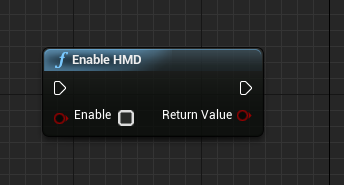 Unreal Engine 4.21.2 how can i activate and deactivate VR and HMD during level changes? I've searched many online sources including the Unreal Engine wiki, forums and answerhub. I want to make a menu level in 2D (Standard mobile app interface) and choose between 2 levels which are in Google VR levels. How can i activate HMD and VR while changing these levels? Have you tried using this BP node? You can set it to true/false on BeginPlay of each of your levels. Not the answer you're looking for? Browse other questions tagged virtual-reality unreal-engine4 google-vr mobile-development unreal-blueprint or ask your own question. How to edit AActor pointer through blueprint in unreal engine 4? Unreal Engine 4: How to load map with different game mode? Unreal Engine: how to activate the keyboard?